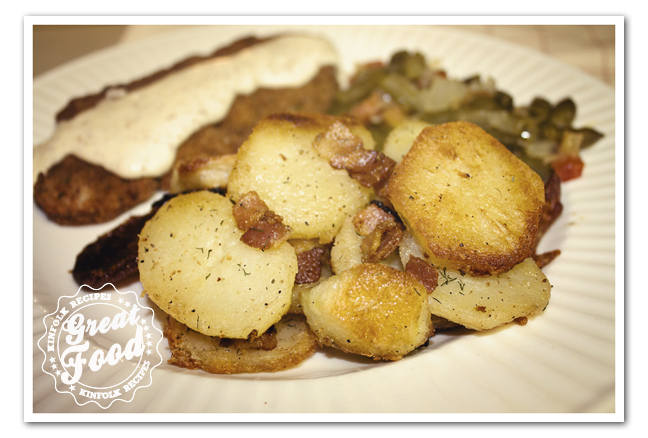 Yes I know, you are thinking another roasted potato recipe??? Yes another one a little bit more prep but for sure really tasty. 1. Peel slice and wash the potatoes. Add 1/2 tsp of salt to the potatoes and cook till semi done. With that I mean not all the way done, they need to be a bit firm. Mine takes about 10-12 minutes it depends what kind of potatoes you use. 2. While the potatoes are cooking slice the bacon and the onion. 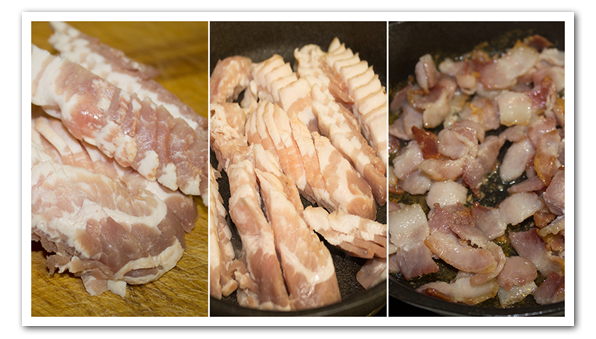 Fry the bacon in a separate pan. 3. Preheat the oven to 425F. Pour the olive oil on your baking pan, I used a cookie sheet. You have to have enough oil to cover the whole dish. After you have cooked the potatoes drain the water. Add the sliced potatoes to your baking dish and top off with the onion, pepper and salt . Bake for about 30 minutes. Check if they start to brown if so turn them over. If need to add some more olive oil. Add the fried bacon and the cheese, bake for another 10 minutes. Peel slice and wash the potatoes. 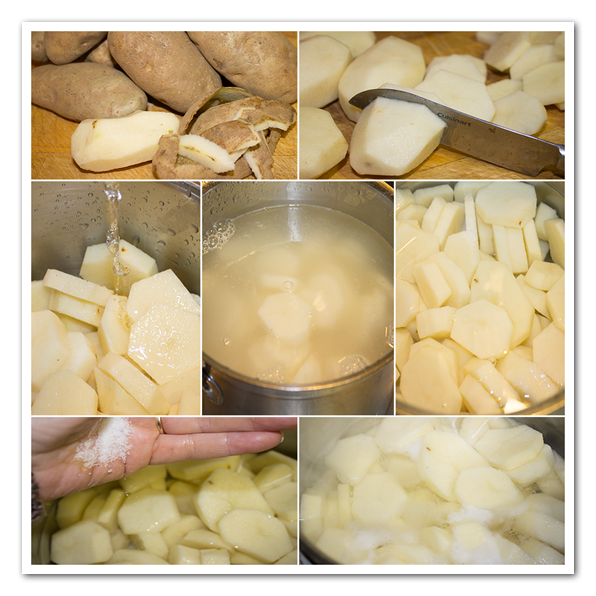 Add ½ tsp of salt to the potatoes and cook till semi done. With that I mean not all the way done, they need to be a bit firm. Mine takes about 10-12 minutes it depends what kind of potatoes you use. While the potatoes are cooking slice the bacon and the onion Fry the bacon in a separate pan. Preheat the oven to 425F. Pour the olive oil on your baking pan, I used a cookie sheet. You have to have enough oil to cover the whole dish. After you have cooked the potatoes drain the water. 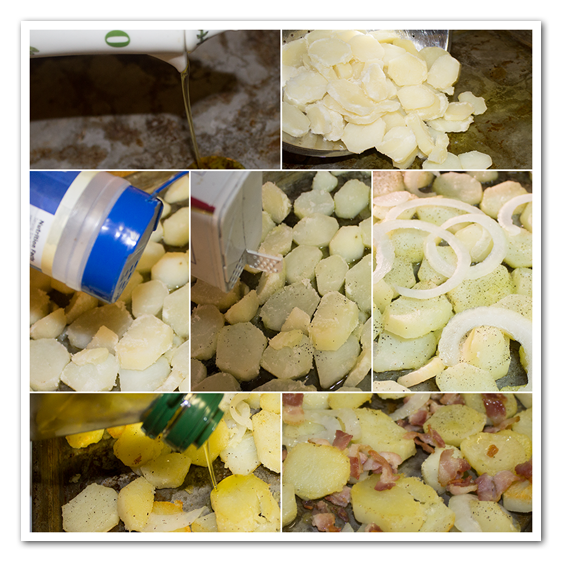 Add the sliced potatoes to your baking dish and top off with the onion, pepper and salt . Bake for about 30 minutes. Check if they start to brown if so turn them over. Add the fried bacon and the cheese and bake for another 10 minutes.